We had out of town visitors a couple weekends ago, and we ended up spending a long lazy day just hanging out on the patio. It was so nice and has me wondering why we don't use the patio more often than we do. We've lived here almost 4 years, and we've only used the patio a handful of times. I'm thinking we definitely need to change that! When we built our house in Wisconsin, we didn't put in a patio or deck right away. A lot of the houses in the neighborhood had concrete patios that were usually put in when the driveway was poured, but we just had some rock brought in. It wasn't the most beautiful thing, but it was usable, and we wanted to wait until we had the money to put in a paver patio. We really liked the way the patio would look, and we liked the idea that there weren't very many paver patios in the neighborhood. 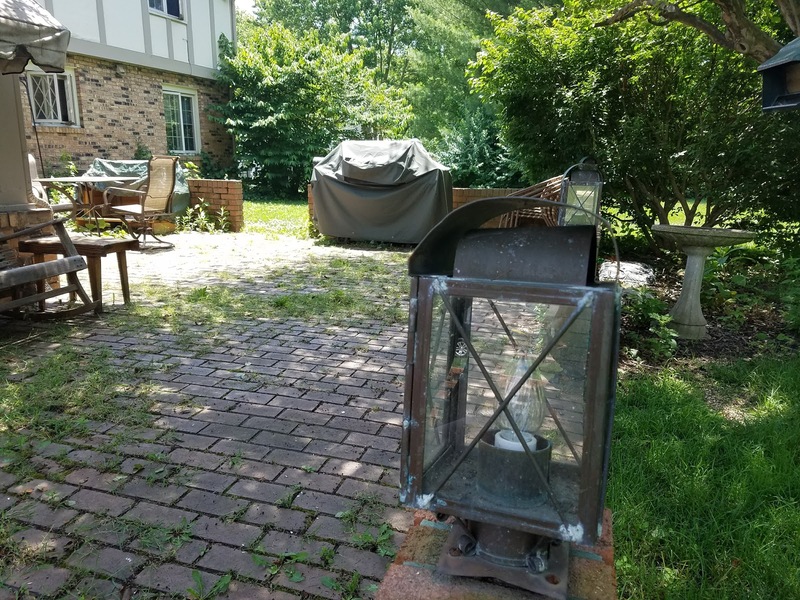 And yes, we know that there are many different patio designs and patio pavers, so even if every other house in the neighborhood had a patio, the odds of them all being the same were really low. Still, in a neighborhood where every house was built by the same contractor, every little bit of individuality is important. 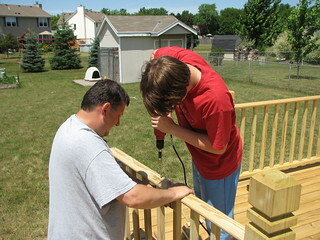 In the end, Jeffrey and Cory built a deck and pergola on the back of the house. I can't remember the exact reason we decided on the deck instead of the patio - perhaps that it was something they could do more easily than put in the patio - but we really loved that deck! Once it was built, we ate dinner out there often. It was also a great place to enjoy my morning coffee and read. It was a wonderful addition to our living space. And it was a great Father/Son project I doubt either one of them will forget. Here we have a nice brick patio with a brick wall all the way around and beautiful hand-made tin light fixtures on the wall. It's showing its age a bit, quite a few of the bricks are coming apart, and weeds keep trying to take over. We mixed up some salt, vinegar, and Dawn and sprayed the weeds a couple years ago, which killed them pretty well, but they're weeds and they keep coming back. One of these days we are going to have to tear out the whole patio - not because of the weeds, but because of all the bricks that keep deteriorating - and put something else in. Maybe this will be our chance for that paver patio, hopefully with a nice stone fireplace or firepit area. We may just go with the poured concrete patio so many of our old neighbors had, but have you seen what they can do with concrete these days? It can look just like a fancy paver patio. Either way, we'll probably have to have someone come in and build the patio for us. We can probably do the demolition, but I'm not so sure about the leveling and installation that comes after. It's important to get the drainage right so that we won't have water standing on the patio when it rains - and it can certainly rain around here! - or water running back to the house and sun room. In the meantime, our patio is still very usable and very pleasant. It's nicely shaded throughout the day and the best place to enjoy our backyard. Even if I can't figure out exactly why we haven't been using it, that doesn't mean we can't do a better job of using it from now on. Jeffrey does need to use his new grill. Often. Does Your Air Conditioner Work?